4 channel servo controller with GCA137 support for polarisation. Optional external switch position sensors. Interactive comfortable setup and mergCBUS FLiM compatible. Smooth running motor due to high resolution stepping. ¹) A CAN bus must be terminated on both ends to get 60 Ohm. Most servo's come with a connector which will fit on Servo 1..4 connector on the CAN-GC6. The signal line (useally orange ) should be at the edge of the board. A nice mounting support is available from GCA. If you are not planning to use this option, F1..F4, U4 and U5 can be omitted. F1..F4 are made for connection of limit switches, to feed-back that turnout is really on its desired position. The best wire to be used with PSK connectors is 0,25 mm². This options flips the polarization relay. Use the external sensor input for this servo instead of the generated event after reaching the wanted position. Bounce the servo slightly after reaching the end position. The Event Nr. to use for reporting that the servo is in position. Shows the Rocrail object ID which is linked to this servo. The servo positions will be reported at SoD event. Only for use with long events. 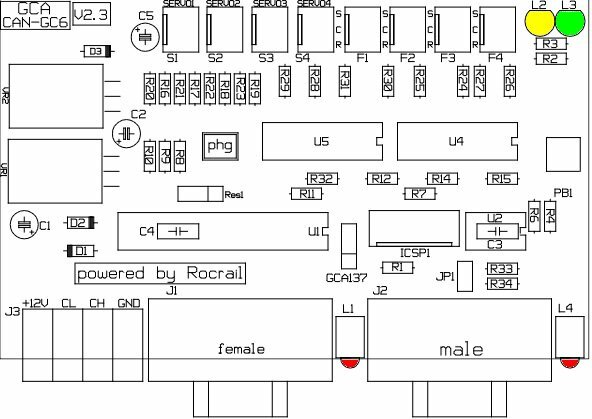 The servo positions will be saved in EEPROM after a Power Off message on CBUS. The switch interface option Single Gate must be set. CAN-GC6 is also provided with connections (F1..4) for hardware feed-back. This is an extra option, to install a switch at both end positions of the turnout frog. This drawing explains how to connect it. Another possibility is the shared use of the circuit of the frog polarization. For this purpose, the frog is connected with the common terminal C = pin 2 and the two track polarities are connected with S = pin 1 and R = pin 3. In this case, the supply of the frog should not be linked over an occupancy sensor, because the current consumption of the optocouplers would simulate an occupancy of the switch. It should be considered that this kind of circuit give a reversed logic for the voltage at the optocouplers. So it's necessary that the not with the frog connected track polarity should connect to the corresponding terminal S or R.